David Brody is a singer, songwriter, and performer. His irreverent and satirical songs touch on love, death, politics and religion. He's been called "a multi-instrumentalist and lyrical wizard with a wit so sharp you need to keep Band-Aids handy". His music is steeped in the Jazz, Folk, and popular music of the 1920's through 1950's. Echoes of Cab Calloway, Hoagy Carmichael, Noël Coward, and the Broadway stage resonate through his very contemporary compositions. Early in his musical career he played bluegrass, old-time, Celtic and swing fiddle with The Delaware Water Gap String Band. Later he played violin and mandolin with The Klezmer Conservatory Band. He recorded nine albums with these groups and other artists on the Flying Fish, Rounder, and Vanguard labels. He has appeared at Avery Fisher Hall and Symphony Space in New York City, at major venues and music festivals across the United States, Canada, and Europe and on Garrison Keillor's radio show A Prairie Home Companion. He has published five books on music including the best-selling The Fiddler's Fakebook. He has had a parallel career as a visual artist and received a graduate degree in painting from Yale University. His work has been shown in close to 100 exhibitions across the United Sates and Europe. It has also been featured and reviewed in numerous publications including Art in America, Artforum, and New Art Examiner among many others. He has been a Fulbright Scholar and a Guggenheim Fellow. He is a Professor at the University of Washington in Seattle. Please also visit davidbrodyart.com. 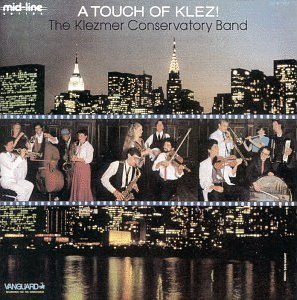 The Klezmer Conservatory Band, "A Touch of Klez"